In January 1945, POW camps throughout Germany swelled from the Allied and Soviet POWs captured during five years of war. With the Russians overrunning Poland, the camps in the east were evacuated and resources, especially food and medicine, were scarce. Conditions went from bad to worse as thousands of men were forced into existing camps around Germany. Despite its last ditch offensives, Germany was finished and everyone knew it. But what would happen to the thousands of POWs and slave laborers as the war drew to a close? This question vexed the Allies repeatedly during the last year of the war. The previous fall had been a frustrating time for the confident Allies. Hope had sprung that the war would be over by Christmas. The Rhine was within reach; so tantalizingly close. But it was not to be. Resistance stiffened at the German border. It was expected, but not to the extent they found. The large envelopments of the summer were gone; replaced by grinding assaults against a well-concealed enemy. And the weather was turning cold. Victory would have to wait. 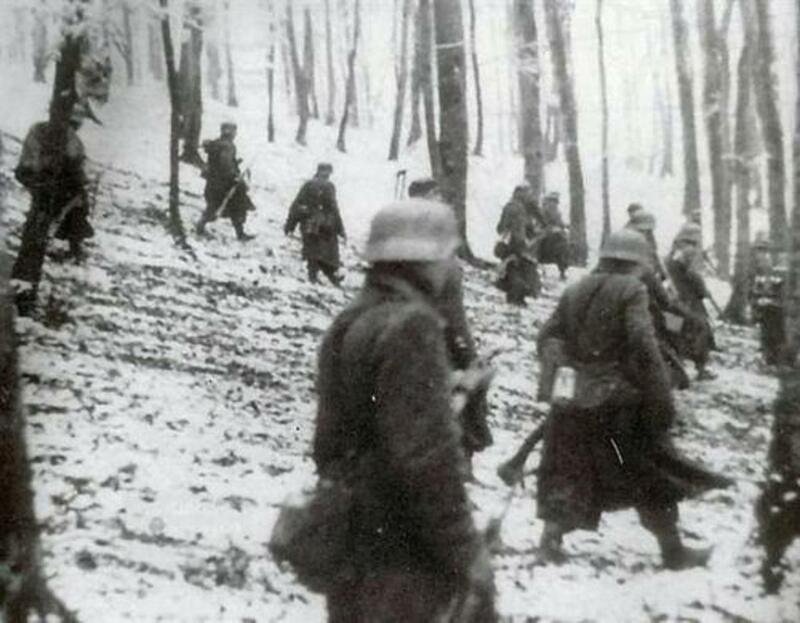 The German attack in the Ardennes Forest, later known as the Battle of the Bulge, began on December 16, 1944 and surprised the Western Allies. As a result, they were slow to react and thousands of American GIs became POWs in the first week of the assault. Many of the American units were new to the front line and their inexperience led to confusion all along the front. Even veteran units were full of replacements. It didn’t help the new arrivals were told their enemy lacked offensive capabilities. Over 20,000 GIs were captured during the entire six week battle; a sobering reminder that the War was not over. One of the hardest hit units was the 106th Infantry Division, which had arrived in the Ardennes just a week before, on December 9. By December 21, two entire infantry regiments and a field artillery battalion were cut off and captured; approximately 7,000 men. This cut the Division’s strength in half. 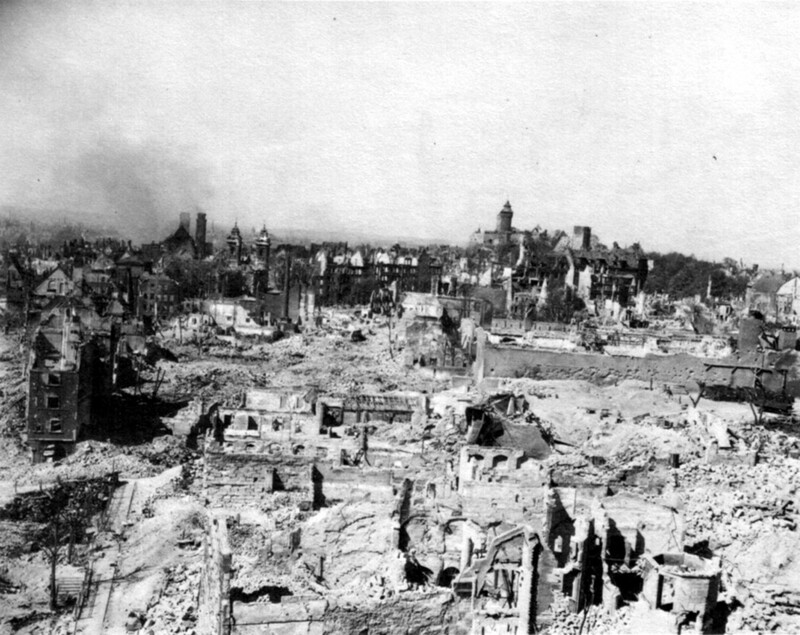 The remnants of the Division did regroup and fight bravely around St. Vith and into Germany. But the stain of that defeat was unfairly attached to the men for a long time. 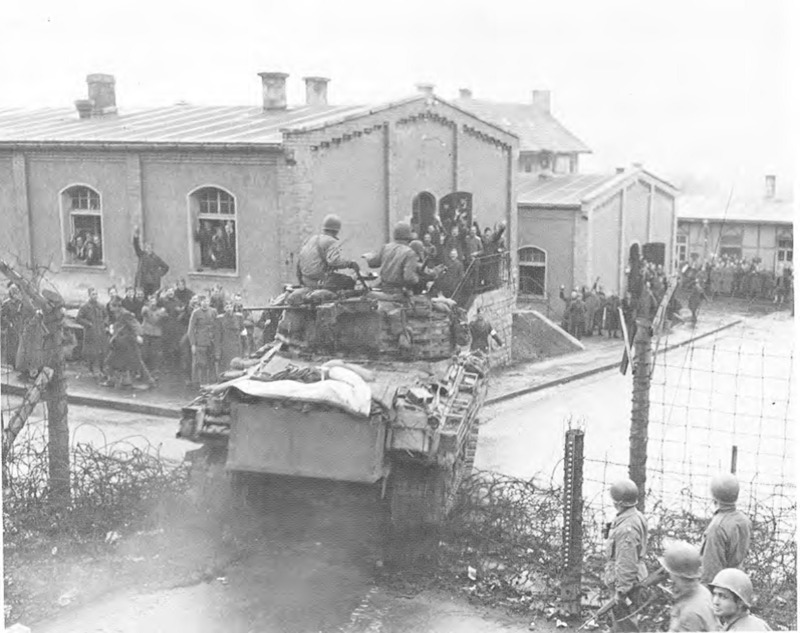 A large group of officers from the 106th Infantry Division ended up at a prison camp near the northern Bavarian village of Hammelburg, located about 75 miles east of Frankfurt. 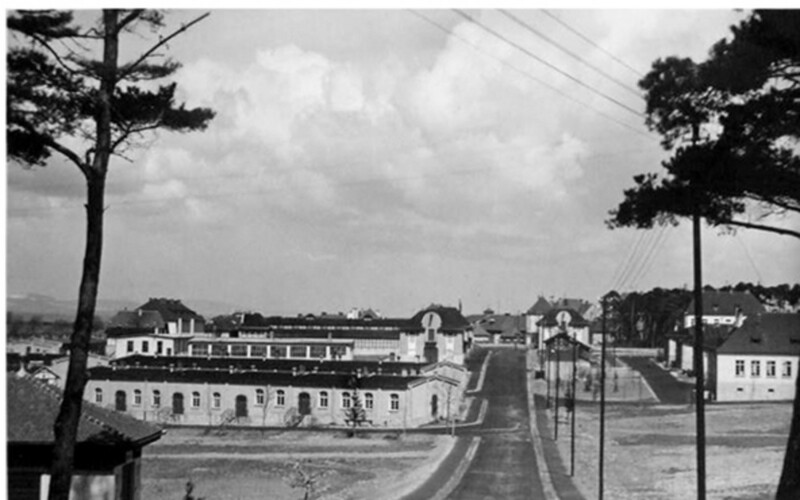 It was a converted military training complex, and became known as Oflag XIII-B (Officers’ Camp 13-B). After their arrival, the camp was almost filled to capacity. The overcrowded conditions made for grim prospects. The spirits of the men were in disarray too. After capture, depression and lethargy became commonplace. The problems were not limited to the 106th. It didn’t help that officers from the 28th Infantry Division made up the other large portion of the Americans at the camp. 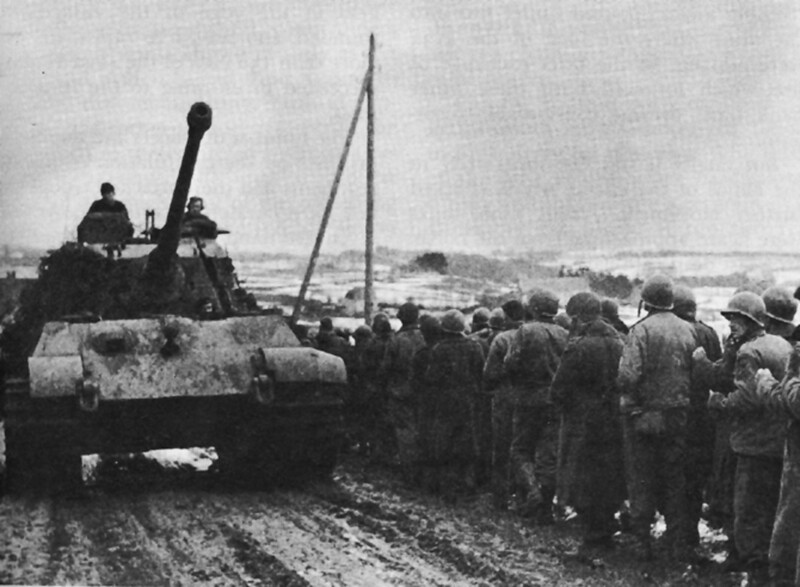 They had been posted east of Bastogne and bore the brunt on the southern flank of the Bulge. The 28th ID had been decimated since arriving in Normandy in June and the Bulge was just another brutal round of fighting with very high casualties. The senior officers captured from the 106th included a regimental commander, Colonel Charles Cavender (423rd IR), a field artillery battalion commander, Lt. Colonel Thomas Paine Kelly (589th FAB) and an infantry battalion commander, Lt. 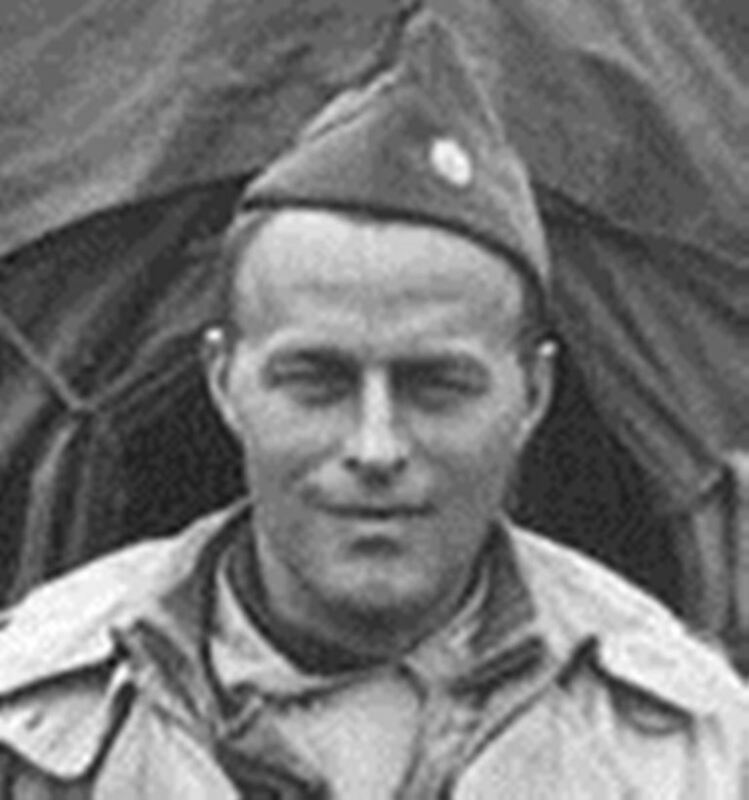 Colonel William Scales (422nd IR). Even the Division Commander’s son, Captain Alan Jones Jr., had become a prisoner. Cavender was a career officer and West Pointer, who had seen action World War I. Kelly, a Florida attorney in civilian life, had been separated from the rest of his battalion during the second day of the attack in attempt to rescue one of his batteries. His attempts thwarted, he linked up with the 422nd Infantry Regiment on the Schnee Eifel, east of St. Vith. After 4 grueling days, they all surrendered on December 19. A large portion of 589th did escape encirclement, but he would not find out the fate of many of his men until after the war. The defeat inflicted upon two regiments and other units of the 106th was devastating psychologically. Both the enlisted men and company-grade officers felt let down by their commanders, particular Cavender and his staff. Creating a united front against the Germans was virtually impossible. Cavender had also established poor relations with the camp commander, Generalmajor Gunther von Goeckel; declaring he would be tried as a war criminal after the war. Things became tense immediately. The burden of blame must have weighted heavily on him, and the stress made him overreact. Cavender’s counterpart with the 422nd, Colonel George Descheneaux, had been separated from the others after the surrender due to his poor physical condition. At Hammelburg, it was the Serbs who were the longest serving POWs, having been captured during Hitler’s invasion of Yugoslavia and Greece in April 1941. They helped the Americans enormously, offering them items from their Red Cross Parcels and other tidbits that they may have picked up while working outside of camp. The Serb doctors also worked tirelessly to aid American medical personnel. Death was always hanging over their heads. Men died of pneumonia and other illnesses. On February 5, Lt. John S. Colman of the 590th Field Artillery Battalion (106th ID) died of pneumonia at the camp hospital. He was 35. Colman, a native of Pawling, NY, was the only American officer believed to have died of natural causes at the camp. But the small cadre of enlisted imprisoned in a nearby compound were hit hard by disease brought on by the overcrowded conditions. In early March of 1945, two more officers arrived at the complex that would have a profound impact on the prisoners’ lives. 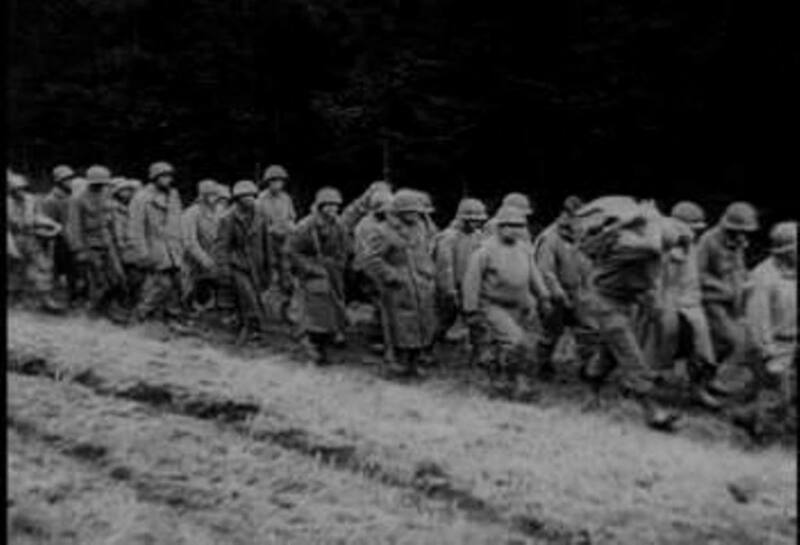 Colonel John K. Waters and Colonel Paul T. Goode, with a group of about 1200 POWs, had been marched west from Poland as the Soviets overran Eastern Europe. They were then forced into crowded, miserable conditions at Hammelburg. 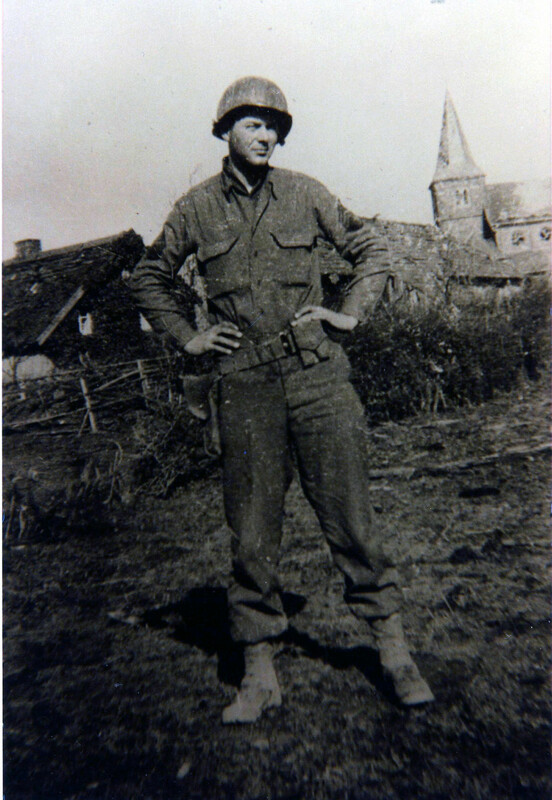 Goode, a regimental commander with the 29th infantry division, was captured in July 1944 at St. Lo in Normandy. Colonel Waters, formerly of the 1st Armored Division, had been captured during the Kasserine Pass debacle in February 1943, where Rommel’s Afrika Korps handed the Americans one of their worst defeats in history. Waters was noteworthy for another reason; he was the son in law of General George S. Patton. Waters and Goode were both hard-driving West Pointers who were captured early into their combat careers. As a consequence, they decided to make their captivity a form of resistance. They were the highest ranking officers at their compounds in Poland. Strict military discipline was enforced. The men had to shave and keep the barracks clean. Saluting all senior officers became mandatory. It was the little things like maintaining your dignity which helped one continue to resist the despair of being a POW. Committees were formed, meetings held, and representatives picked for various duties. Some officers even began teaching classes on different topics. Their system resembled the attitude of the British, whose discipline as POWs and daring escape attempts became legendary. Goode had even obtained a set of bagpipes from the YMCA to keep the men’s spirits up. Not all the men enthralled with the sound, but they certainly appreciated his efforts. Though exhausted and malnourished, upon arrival at Hammelburg, the two career officers began enforcing their ideas almost immediately. Colonel Cavender, the ranking officer, was quickly replaced by Goode, who established better relations with von Goeckel. Goode and Waters were appalled at what had happened. 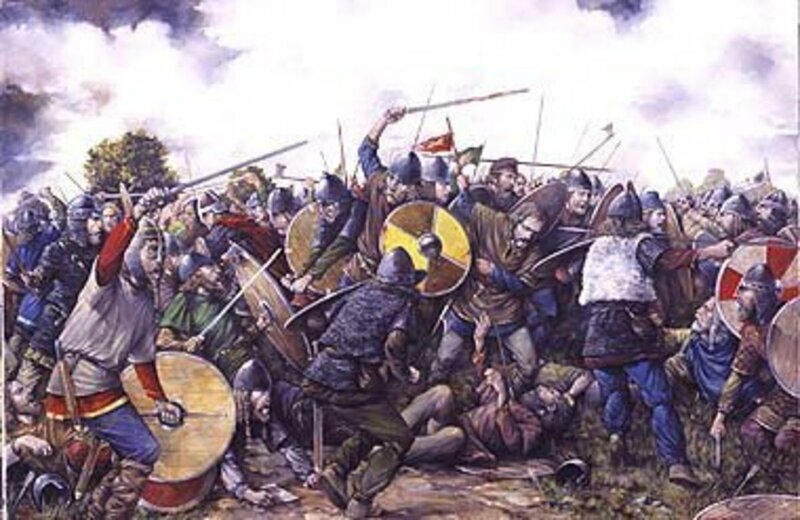 Discipline had broken down amongst the 106th men since their arrival. They were disheveled and disrespectful. It got so bad, the younger officers refused to salute Colonel Cavender. Resentment was rife. The changes helped enormously. Lt. E.V. Creel (590th FAB) stated that Goode and Waters made an immediate impact on the discipline of the camp. He called them some of the most impressive officers he had met during his time in the Army. The men appreciated their experience on how to survive as a prisoner and felt a renewed sense of camaraderie within just a few days. Army discipline had been restored and they were now a cohesive force, with Goode their spokesman. All in the camp knew the Germans were finished; it was just a matter of time. The biggest concern was whether their captors realized the war was lost, and could conceive of a future after the war. By the middle of March, although things had improved, the camp was still a very dangerous place. Lt. Charles Weeks of the 423rd’s HQ Company was murdered by a guard. He had been late coming back from the latrine during an air raid, so one of the camp guards in the tower put a bullet in the back of his head. He was just outside the door of the barracks. Witnesses stated that he had been walking with his hands in his pockets. Despite the danger of being shot, four lieutenants along with the Chaplain of the 422nd Infantry Regiment, Father Paul Cavanaugh, bravely ran outside and grabbed his body to render aid. Goeckel claimed it was a misunderstanding on the part of the guard. It wasn’t the first time this had happened. Back in January, Lt. George Vaream, a member of the 106th Reconnaissance Troop, was shot and killed by a guard during another air raid in January. Within the Allied High Command, rumors of horrific conditions for the POWs had been rampant for months. After the revelation of the Malmedy Massacre during the opening days of the Bulge, Allied officials came to believe that many long serving POWs might be executed before Germany surrendered. How many of the top brass believed this, no one will ever really know. Access to detailed intelligence reports concerning POWs was very limited at that time and who knew what is still a subject of debate. For Patton, it became a pretext for a suicide mission miles behind enemy lines. 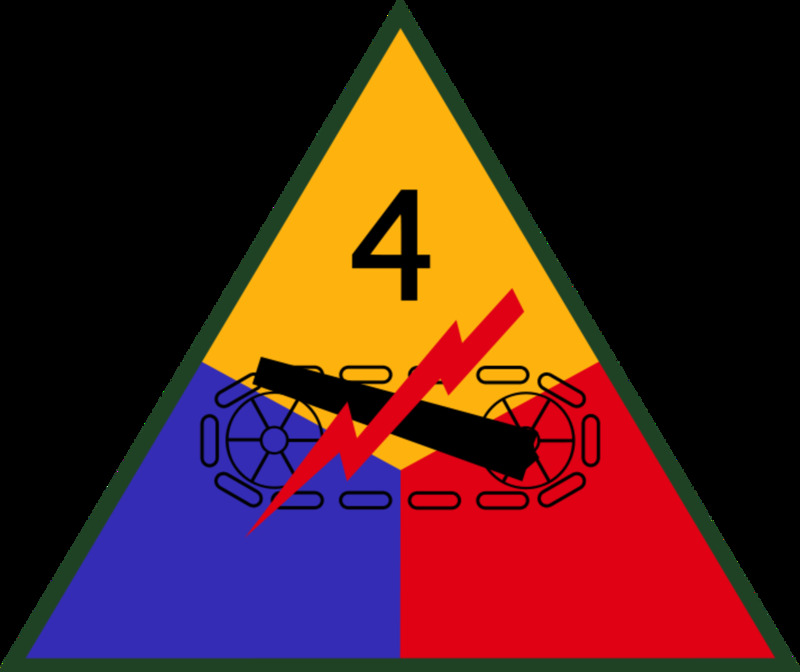 So he selected men from one of his favorite units, the 4th Armored Division. The Division had gained a lot of notoriety in late December when it helped relieve Bastogne. It was full of veterans who had seen action since their arrival in Normandy. Many were highly decorated. So it was no surprise that Patton called on them for his secret mission. It didn’t hurt that the Division’s CO, Major General Hugh Gaffey, was also a close friend of Patton’s and his former chief of staff. Patton was counting on the discretion of his friends to tamp down any controversy afterwards. 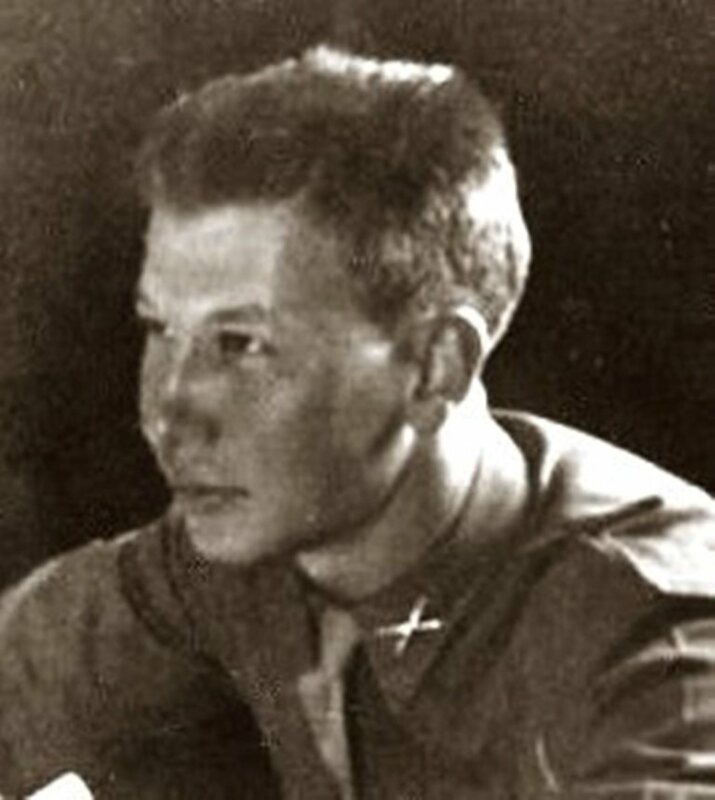 With very little time to prepare, Captain Abe Baum, the 37th Tank Battalion’s S-3, was chosen to lead the group. He was not their first choice. In another weird twist of fate, the tank battalion commander originally selected to lead the raid was on sick call. So he recommended Baum. Should Patton Have Ordered The Raid? Yes - It was the right thing to do. Neither Goode nor Waters were expecting a rescue mission of any kind; neither had a sense of inflated importance. Rumors always floated around but they never panned out. So on the morning of March 27th everyone in the camp was shocked when the sound of small arms fire and Sherman tanks rumbling down the road started echoing around the camp. Lt. Colonel Kelly, like everyone else, ran out to see the commotion. The senior officers conferred for a while unsure of how to proceed if the camp came under fire. Initially, the men lingered outside listening to the fighting. Then it got closer; then rounds started falling close to the camp and bullets began ricocheting off the buildings. It took several hours until tanks burst through the main gate. The POWs slowly came out of hiding. In the confusion, Waters was wounded by a lone German soldier hiding just outside the gate. He was hit in the lower back and buttocks while he carried a white flag to meet the Shermans, which had been done at the request of Colonel Von Goeckel. Now partially paralyzed, he was carried back to camp where Serbian doctors saved his life. 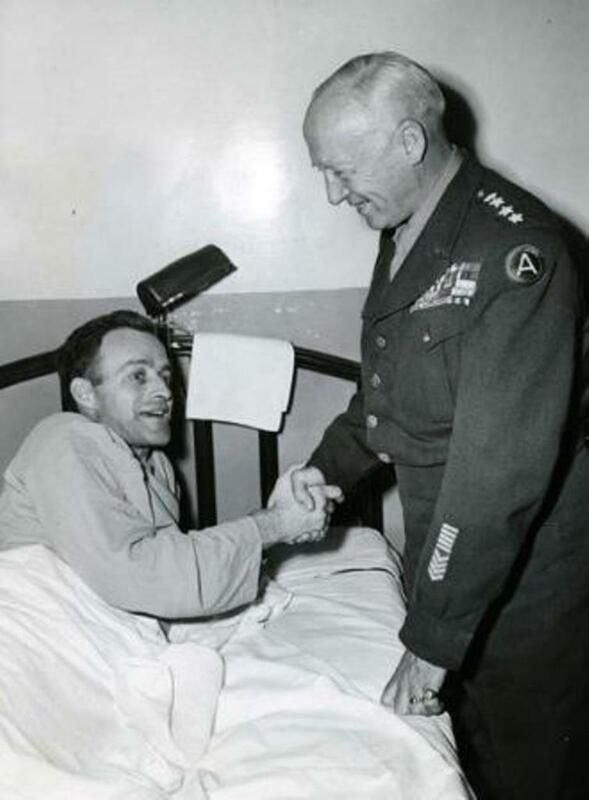 Task Force Leader Captain Abe Baum, and Major Alexander Stiller, a Patton aide acting as an “observer,” finally made it into the compound and immediately began to inquire about the famous prisoner. Cavender gave them the bad news: Waters could not be moved. Desperate, Captain Baum decided to see for himself. Sure enough, the doctors told him to forget about transporting Waters or any of the wounded. Baum now faced the decision of his life. Would he try to get everyone out and leave without the wounded? Four years earlier he had not imagined himself trapped behind enemy lines leading a secret raid. He had been a pattern cutter from the Bronx, enlisted after Pearl Harbor and steadily rose through the ranks. 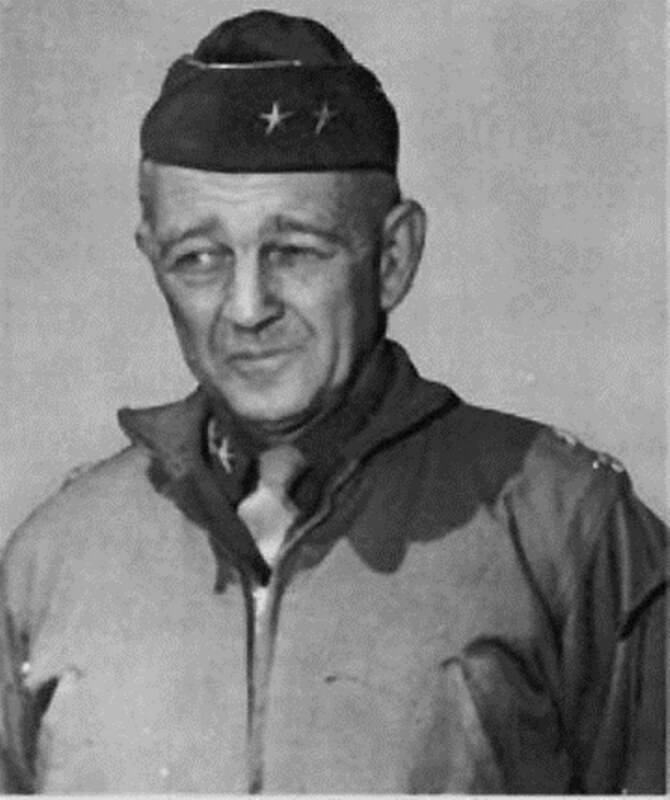 By early 1945, he was one of the 4th AD’s most trusted field commanders. There was another glaring problem. 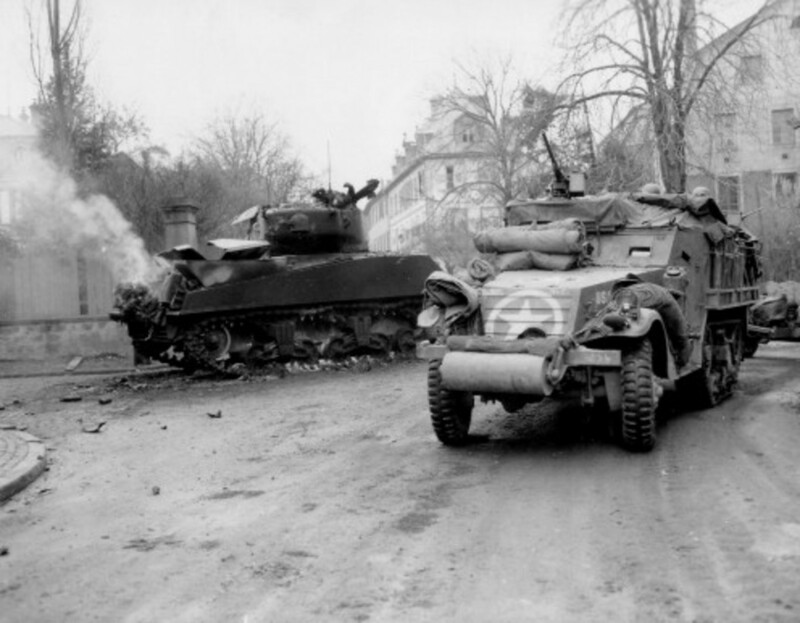 The small force, which had numbered about 300 men with 16 tanks (Shermans and M5A1 Light tanks), 27 half-tracks and assorted other vehicles, had lost almost a third of its strength. It had used up much of its gasoline in the drive through Bavaria to get there. They had covered over 60 miles in less than two days. Along the way they had run into determined opposition of ad hoc units of Germans, but also surrendering German soldiers and jubilant Russian slave laborers. Wounded had to be left along the route for the German Army to pick up. The dead were buried by German civilians. Now they had to turn around and do it all over again. Baum knew he could not hold out this far behind enemy lines, but felt compelled to help these long-suffering GIs. 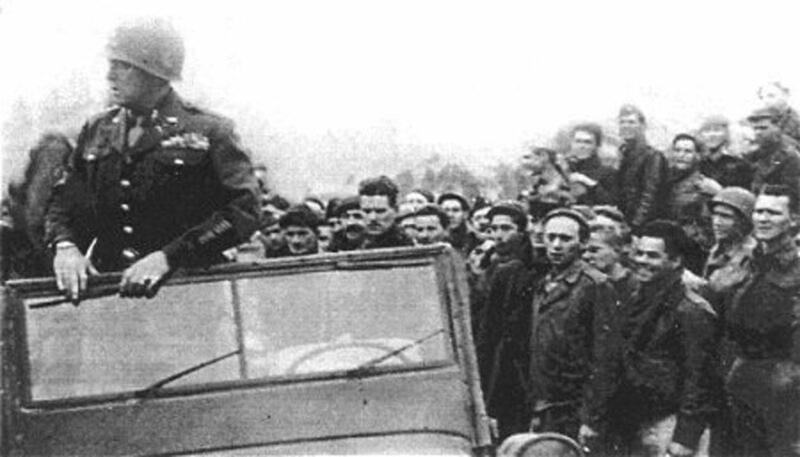 So he offered the POWs a chance to get on top of the tanks and ride out. The initial joy that the men had felt at being liberated was now replaced by worry once more. The whole American Army was not waiting outside the gate; the frontline was still 50 miles away. Kelly was happy to be free, but did not like the odds of riding on top of a moving target in bad weather. Declining the offer, he obtained a compass and looked around for anyone else willing to walk cross-country to American lines. His former A Battery commander, Captain Aloysius Menke, quickly concurred. Menke, as his name suggests knew a little German, which would turn out to be a godsend. Their friend, Lieutenant Colonel Scales, volunteered to go with them. Lieutenant Johanovic, one of their Serbian Army buddies, also asked to go along despite his poor physical condition. They immediately took off for the nearest swath of woods and planned to stay off the roads as much as possible. Within just a few hours, their Serbian comrade realized he could not make it very far. Four years of captivity had taken its toll. So he volunteered to go back to camp, but not before he emptied his pockets of any rations he was carrying, graciously offering them to his fellow prisoners. Starting off again, they walked for a day until they began to encounter a series of small villages. They made it through the first few as quietly as possibly. Late one night on the edge of a blacked out village, the three men were just inside the tree line trying to formulate a plan for getting through it unnoticed. The houses were spread out over large farm fields. Dense woods lay on the other side. They feared their luck was running out. Besides the villagers, there were the ever-present barking dogs. Kelly and the others sought another way around. To avoid it would have involved walking miles out of the way, adding misery to their already fragile condition. Menke came up with an idea. Instead of just creeping through the houses haphazardly, the three would march right down the main drag of the village in a small column similar to any other group of soldiers. In the darkness, no one would think twice. Menke figured the dogs are probably very used to the sound of boots in lockstep anyway. Marching single file, they stomped right up the street with hearts in their throats. There was no reaction from the populace, human or canine. After reaching the last house, they immediately dashed for the woods and cover. The next day they reached what might have been an obstacle too much for even these determined men. It was a fifty foot-wide river tributary with a highway bridge crossing. One guard stood on alert, pacing back and forth. Kelly, Menke and Scales spread out, searching desperately for another way across. Large boulders, a narrow point in the river, or even a large fallen tree would help. It was a fruitless search. The swollen river offered no respite from its freezing waters. There was no other way except right across the bridge. Kelly suggested charging the guard and overpowering him. Menke again came up with a plan. Bluff past the guard by telling him they were enlisted POW laborers from one of the numerous farms in the area and were lost. Kelly and Scales were doubtful, but agreed. Menke said if worse comes to worse, the two could tackle the guard while Menke went for the jugular. The young captain took the lead, carefully approaching the aged German with a relaxed but forlorn look on his face. He tried to explain using his hands and a phrase here and there. Behind him, Kelly and Scales acted nonchalant. They pretended to yawn, and look disinterested. The frightened old man let them pass, gesturing with his single shot rifle and they scampered away. About 100 yards away from the bridge, a shot rang out that whizzed over their heads. It might have been a face-saving measure. Diving to the ground, they crawled to the woods and safety. No other shots rang out, and they moved out even faster. After a couple of more days, with the food gone, Menke decided to go off on his own to either find the Americans or food, whatever came first. Luckily, he ran into men from the U.S. Seventh Army and led them to the others. They were finally free for good. Only one other officer from the Division, Captain Edmund C. Roberts (422nd/D), is known to have made it safely back to American lines. Capt. Roberts was later killed during the Korean War. Kelly’s friend Lt. Johanovic survived the last month of captivity, and the two became lifelong friends. The rest of the task force and the newly freed POWs, including Lieutenant Creel and Captain Jones, met fierce resistance along the way, which virtually destroyed the entire force just a few miles west of Hammelburg. Most were recaptured, and several suffered grievous injuries. Baum was seriously wounded and spent the next 10 days at Hammelburg in the POW hospital along with Colonel Waters. They were finally liberated by the 14th Armored Division on April 9. Waters was upset and embarrassed about the raid when he realized it was an attempt by Patton to get him out. He fully recovered from his injuries and went on to an illustrious Army career ending up a four star general like his famous father in law. Twenty five men of Task Force Baum were listed as killed or missing. Many men who were part of the Task Force claim the figure is higher. Approximately 20 of Baum’s men managed to escape encirclement and make it back to American lines. The secrecy surrounding the raid right after the war led to various inaccuracies in the official documents. Despite years of researchers working to piece together the real story and many of the survivors publishing their accounts, confusion exists to this day over the exact number of casualties. For the long-suffering POWs, it had been too good to be true. They were marched back to their old barracks. Many were relocated to other camps within the next few days. Just as before, many would die from exposure, disease and Allied bombings. Goode and many of the others were sent to another infamous camp, Stalag VII-A at Moosberg, to sit out the rest of the war and would become witnesses to another famous liberation. Stalag VII-A was meant to hold about 10,000. It ended up with almost 100,000 by war’s end. The forced march to the camp became yet another horrific chapter in the prisoners’ experience. Amazingly, most would survive but some were not so lucky. One of those unlucky few was Lieutenant John Losh of the 590th Field Artillery. The Queens, New York resident had survived several torturous months as a prisoner until he was temporarily liberated during the Hammelburg raid. Ultimately, he too was recaptured and shipped out to another camp. During that march, his ragged group ended up at Nuremberg. Those in this group included Father Cavanaugh and Lt. Jim Keough, who was close with Losh. Cavanaugh ran over to see Losh lying face down in the crater; but he was alive. Bomb fragments had hit him in the side, tearing through vital organs. A shirt was wrapped around his stomach to hold in his guts. Cavanaugh reached down and cradled his head. Losh asked Cavanaugh if he was going to be alright. No one really knew, but he assured the grievously injured officer that he would be okay. Losh died a few days later at a hospital for British POWs, an indirect victim of Patton’s hubris. John H. Losh is buried at Lorraine American Cemetery in St. Avold, France, Plot K, Row 49, Grave 19. 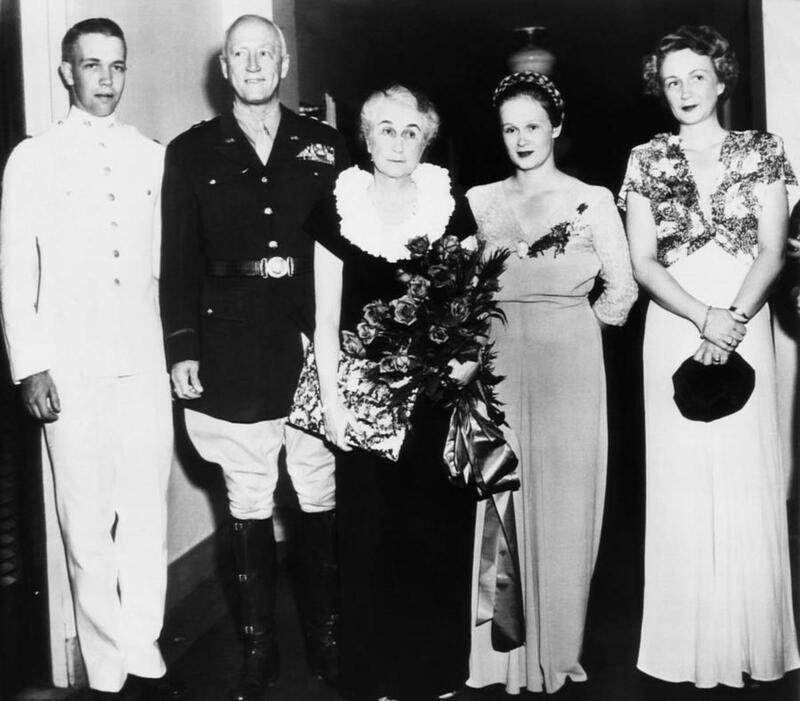 His widow, Isabel, would become a member of the Gold Star Wives of America, even meeting with Mrs. Eisenhower on a visit to the White House in 1953. Captain Edward Luzzie, also of the 590th, lost a leg during the bombing in Nuremberg, but survived to return to his law practice in Chicago. 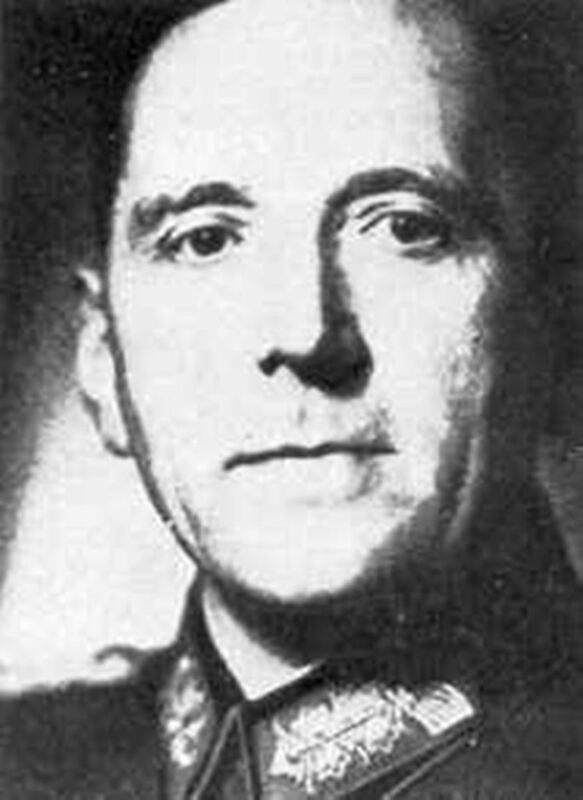 Cavender sustained serious injuries during these bombings and after the war he needed surgery in England. Both Keough and Cavanaugh survived the war. Fr. Cavanaugh returned to the U.S. where he continued his work as a Jesuit Priest before passing away in 1979. The controversy over the mission will always remain. The death of President Roosevelt on April 12th overshadowed the failed mission and worked in Patton’s favor. With correspondents distracted, any reprimand of Patton by Eisenhower remained in house for some time. Patton made various claims after the war about the real purpose of the mission. At first, he claimed that the chance of execution was too great not to try and he had no idea that Waters was at the camp. That is a dubious claim at best. The U.S. Seventh Army was on Patton’s southern flank and just days away from reaching the area. Why would any commander take such a risk? Abe Baum always assumed that the only reason Major Stiller had gone along was to identify Colonel Waters. Patton also had access to intelligence via Ultra, the British program that broke the German codes. The locations of the camps and the movements of POWs were well known to the Allied High Command. Details of that program did not come out until long after the war ended. He would have been forbidden to speak of that fact even after the war. Also, Third Army’s intelligence staff was finally getting access to newly liberated or escaped POWs who were reporting the horrific conditions inside the camps. These reports must have played a role in the decision. There’s no doubt that the idea of his daughter becoming a widow so close to the end of the war must have weighed heavily on Patton and led to his rash decision. Behind the veneer of his tough guy image, lay a real human being, who doted on his daughters. One can imagine the letters he was receiving from his wife about Beatrice's anxieties. The wartime stress took a toll on Beatrice Patton Waters. After a decade of worry and loss, the mother of two would die in 1952 of a heart attack while her husband was in Korea. She was 41. Alcoholism played a major role in her poor health. Her mother died the following year. The proud general did admit one failure when it came to the raid. He did not send a large enough force. In one of his last interviews, he displayed his personal and official diaries to an Associated Press correspondent. This was supposed to show he did not know Waters was at the camp and that the raid had been conducted out of fear that the POWs could be murdered. Had Patton lived longer we might have gotten a more detailed explanation. With his death from injuries sustained in a car accident in December 1945, any chance of that was gone. 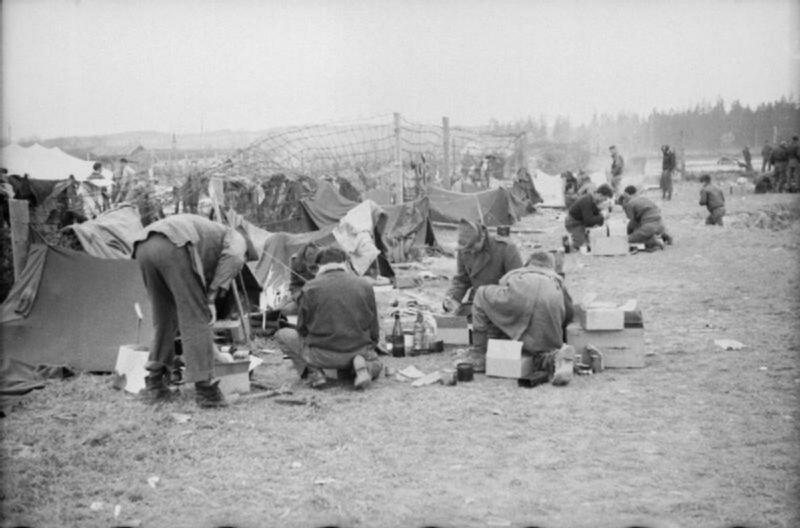 After the war, the camp was taken over by the U.S. Army. It was later transferred back to the West German Army as a training base, and remains so under the now unified German Army. Generalmajor von Goeckel escaped prosecution but was detained until 1947. He and his wife went into the dairy business. He passed away in 1979. Colonel John Waters spent a year recuperating from his wounds and remained in the Army. 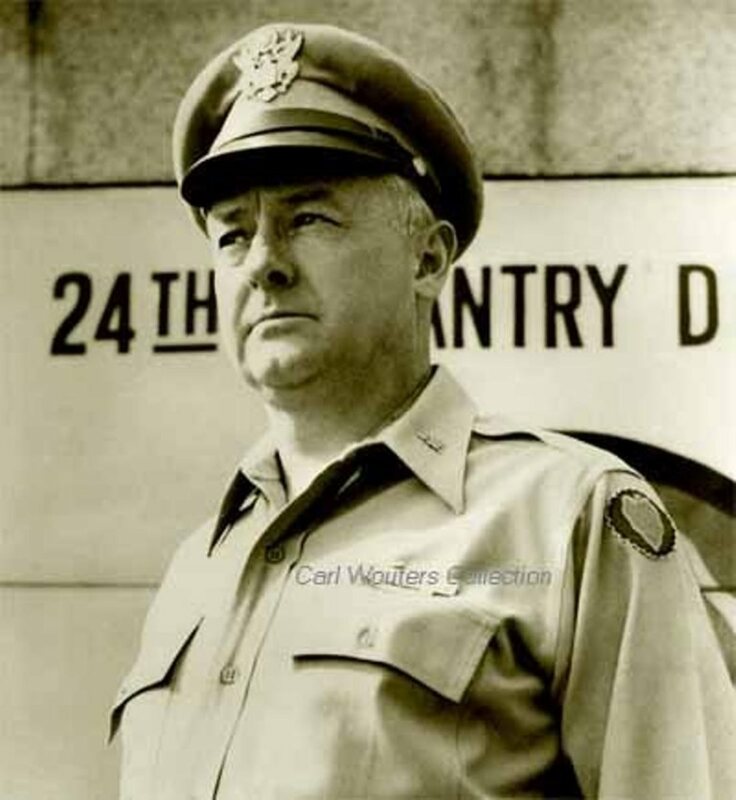 After returning to duty, he served as military aide to Secretary of War Robert P. Patterson, commanded various armored division units in the United States and Korea, and was chief of the Military Assistance Staff in Yugoslavia. In 1951 he was commandant of cadets at West Point. 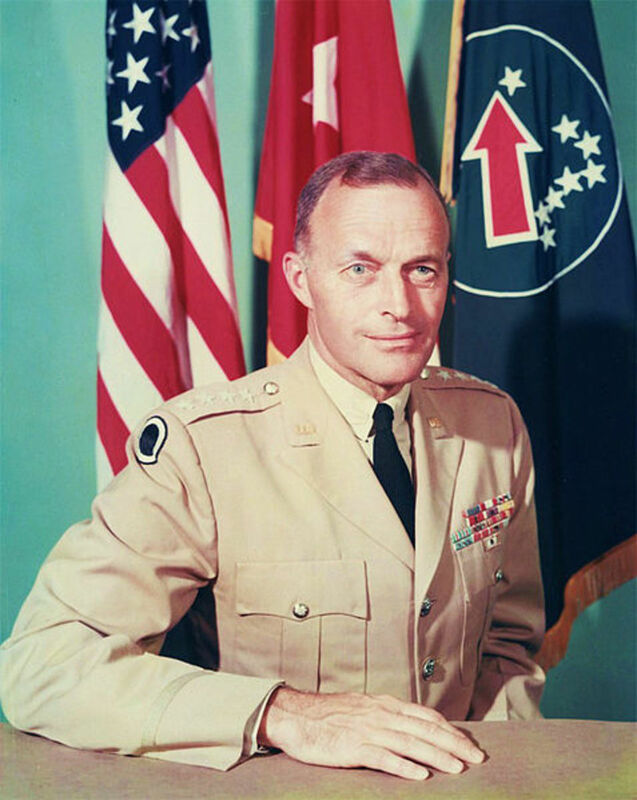 He retired from the Army as a full general in 1966 while commander of the United States Army of the Pacific. Mr. Waters remarried after the death of his first wife to Anne McKinley, and the union lasted until his death in 1989 at the age of 82. Colonel Paul Goode retired from the Army on a disability in 1952. He developed health problems after the war due to his POW experiences and passed away in 1959. 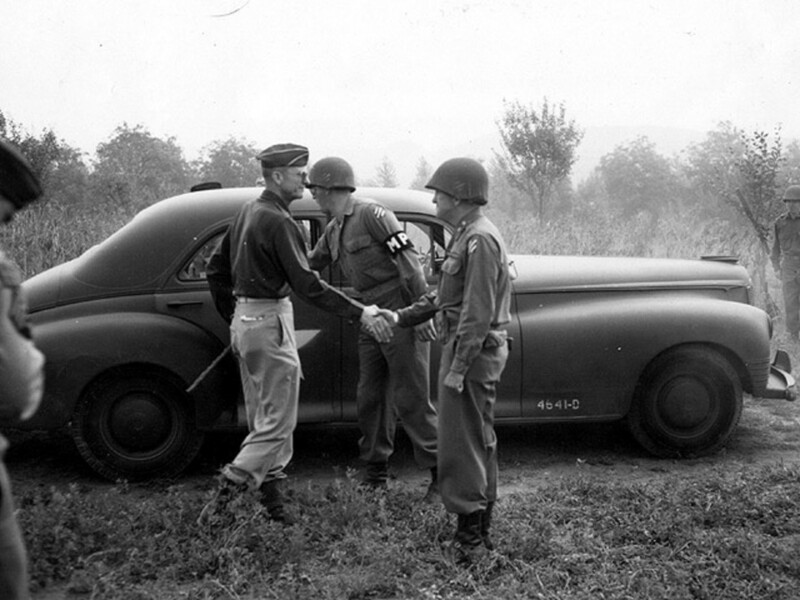 Colonel Kelly was awarded a Silver Star for his actions of December 16-17, 1944. He returned home to his law practice in the Tampa area and passed away in 2008 at the age of 95. In 1996, he published his autobiography, Fifty Years of Courting. Captain Abe Baum, the feisty leader of the Task Force, lived to the ripe old age of 91; passing away in March 2013. He started his own business after the war but remained active in military and veteran affairs, leading several organizations. During the late 1940s, he became a consultant to the Israelis and their fledgling army. Aloysius Menke returned to Ohio after the war and went into the grocery business for Proctor and Gamble. He passed away in 2011 at the age of 90. Colonel Cavender stayed in the Army, retiring in 1953. He attended many of the Division Association’s reunions and was warmly received; the years dissipated any lingering resentment towards him. He passed away in 1995 at the age of 97. E.V. Creel stayed in the Army, serving in Korea and retiring in 1970 after almost 30 years. He retired to Florida where he began a second career in business. He met his wife, Isolde, while stationed in Berlin. He passed away in 2010. If anyone from the New York area knew the Loshes or is related in some way, I would love to hear from you. Despite my efforts, information has been spotty. Other than the 1940 Census, his service record and grave, I don’t have a lot of information on Lt. Losh. The only photograph found of him is from the formal picture taken of A Battery shortly before they left Indiana. John was born in Canada in 1916. According to the 1940 Census, he had been living with his English-born parents, sister Barbara and cousin Stanley Sefton. The section of Queens might have been either Jamaica Estates or Queens Village (I have the address and the house still stands). His sister taught piano out of their house and their dad worked as a maintenance man at a large retail store. John was working at a local pharmacy prior to induction. None of the surviving men of the Division association knew him and I have been unable to find any living family members. It appears he got married either just before induction or while in the service. There was one daughter, Mary Alice, who was probably was about 2 when her dad was killed. Mrs. Losh and Mary Alice were living at her parents house in Ozone Park, Queens at the time of John's death. Mrs. Losh's maiden name was Knight. In an added tragedy, her dad passed away in February 1945. His buddy Jim Keough (I believe), has passed as well. The account of Losh's time as a POW comes from the journal of Father Cavanaugh, the regimental chaplain in the 106th ID. In my interview with Mr. Creel, he mentioned Losh, but did not remember much about him. I did find a picture of his wife at the White House in 1953 from the Pittsburgh Gazette. Update: I was contacted by a cousin of Mary Alice in late 2014. She had been creating her own family tree and remembered that she had not spoken to her cousin in quite a while. Apparently Lt. Losh's daughter is alive and well in upstate NY. Baron, Richard, Baum, Abe, and Goldhurst, Richard. Raid! The Untold Story of Patton’s Secret Mission. New York: Dell, 1981. Cavanaugh, Paul W. S.J. Pro Deo et Patria. Ed. 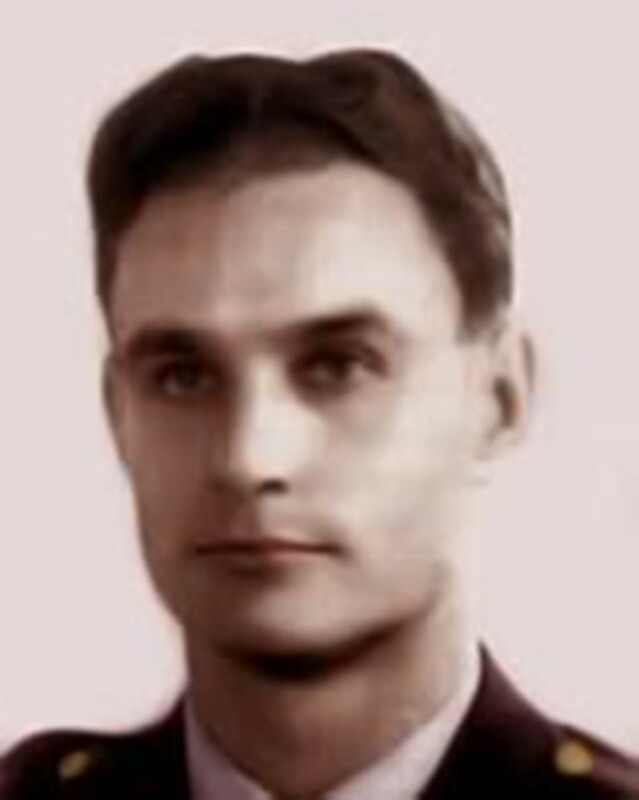 Robert Skopak. Lexington: Palmetto Press, 2004. Whiting, Charles. 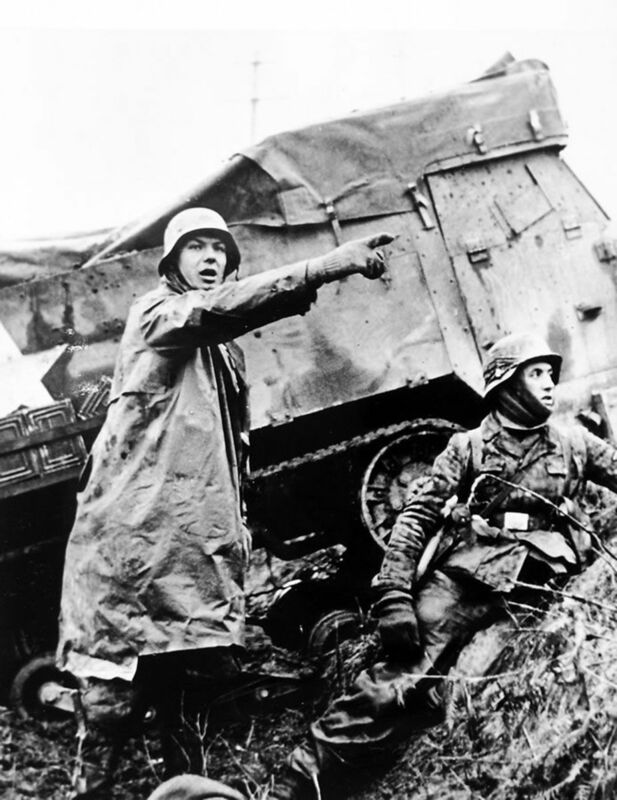 48 Hours to Hammelburg: Patton’s Secret Mission. New York: Ballantine, 1970. John H. Losh, 48-43,” Field Artillery Officer Candidate alumni website. U.S. Army Field Artillery Officer Candidate School Alumni Association. “Decorated WWII Hero Abraham Baum Dies at 91.” San Diego Union Times Obituary. 21 March 2013. http://www.utsandiego.com/news/2013/mar/21/abraham-baum-decorated-veteran/. Phone Interview with E.V. Creel, October 2005. The Lone Viking Warrior on Stamford Bridge. Graham, you've left me speechless (or in this case, wordless...). I'm glad I can help highlight their struggles, especially now that they're all gone. Still highly recommend Baum's book to everyone. Extraordinary life. 3 months ago from Lancashire. England. Hi CJ. I have come back to this hub several times and yes it is a masterpiece. Still one of the very best I have read. - Graham. It's high praise to hear from you, Graham. Also a first to hear the term "masterpiece" to describe my work, but I'll take it. :) Hammelburg is one of my favorite hubs and so glad you liked it. As always, I will continue to strive for improvement (and better editing skills). 19 months ago from Lancashire. England. Well done CJ. Another masterpiece of research and endeavour. Always a pleasure to read your first class work. Thx Tamara. Really appreciate it. I try. Best part of the research was hearing it from people who were there. Fascinating. Stay well. Thx Mr. Taylor. I run a Facebook page that salutes artillery officers and I'm always looking for great stories/photos. I do a "Reg Leg of the week" feature. If you ever want to share your dad's story, just email me via HP. One of the stories that I remember my dad telling was when Lt. Losh, after a few beverages, called in a strike on the Leaning Tower of Pisa. The firebase had a list of coordinates that were not to be fired on so the tower survived but his superiors did not see the humor in the matter. That's great to hear Mr. Taylor. Nice to hear he was a bit of a "character." Hopefully one day I will get in touch with the family again. Your dad was an artillery officer in the war? Thx. My dad graduated from OCS at Fort Sill with John Losh. I never met Lt. Losh-he was killed before I was born-but heard my parents speak of him many times. From what I heard he was a "character"-in a good way. They called him "Johnno"
Thx, Mr. Sacchi. In the grand scheme of things, this was a minor incident that would have been a major scandal today. But it was also a monumental moment in the lives of the men who were there. But to me, it's a character study of Patton. 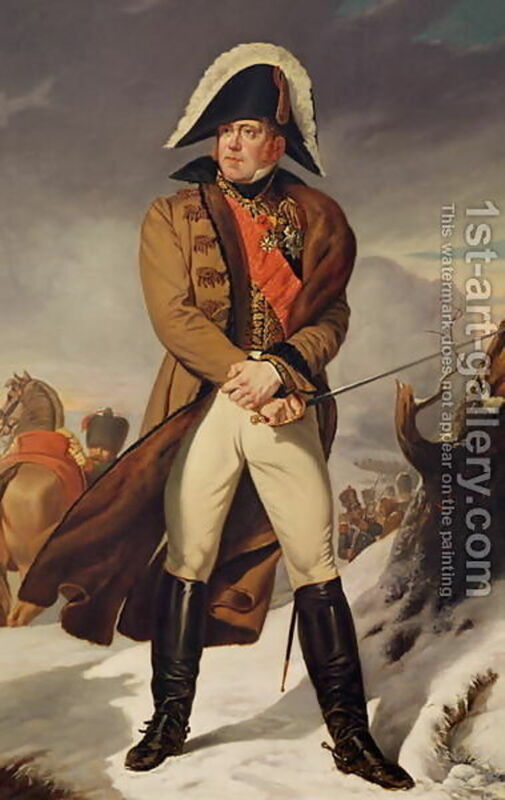 He wasn't the cold-hearted General that he portrayed himself; just a family man who cared about his troubled daughter and made a foolish decision. There were gray areas back then. They just didn't get the attention such gray areas received in subsequent years. There also wasn't as much interest in getting perfection back then. The Hammelberg debacle would have been a major news story with the press hounding The President about it. As bad as it was there were many other greater setbacks and gray areas that got little attention by today's standards. Who would ever think we would see a time of devastating conflict as a "simpler time," but it's true. No gray areas. Thx. I'm glad to see these stories brought to light, though it is tragic that World War 2 seems to be the last time the world agreed on good and evil, right and wrong, and then fight it. Wow, thank you for commenting on my humble beginner hub. It caused me to look at this and although I've just had a chance to skim the text and look at the photos, I can't wait to go back an ready it. What wonderful content. Thank you for sharing it. Off to dinner and back shortly. Thank you again!! Thanks, Mr. Sacchi. It's always interesting to see what happened to the men after these great events. And I'm still searching for Losh relatives. Would love to update it soon. Great article. The detail is very good and I really like the postscript information. Thanks, Patricia. I highly recommend reading the source material. You should share your dad's stories on HP. That would be great. Quite an indepth account...my Father was in WWI and WWII believe it or not...and he told many stories of his experiences. Reading this I just kept shaking my head and wondering how these precious men managed to survive. Thanks, Melissa. I'm honored that you would use my work in the classroom. If you need any further info, just let me know. Thank for researching, writing, and publishing such a thorough account of this interesting event in history. I learned so much and look forward to sharing it with my students. Thanks Blackspaniel1. It's always amazing to speak with people who were there and remember minute details. I think I probably left stuff out from an interview. I need to find my notes. I am amazed at how much detail you were able to find. Well done. Fantastic hub, very very interesting, a really great read, thank you! Thanks for commenting, Mr. Jasper. His son did have an excellent career, but very "under the radar." Can't imagine him teaching English. I used to live near the Academy (Cold Spring) and went to a lot of games. You should write a hub on your time at West Point. Everyone who went there has told me it's a "great place to be from, but never again." The story of Patton's accident is endlessly fascinating, and it might make a good hub if someone else hasn't already done it (no conspiracy theories though...). Side Note: My father had tried to enlist at the time of Pearl Harbor and was turned down for medical reasons. At the time he was working for the National Safety Council in Chicago. In 1943 he was hired by the Navy Department to create a driver training program for all Navy drivers, later going on to become the Safety Superintendent of the Portsmouth Naval Shipyard until he retired. 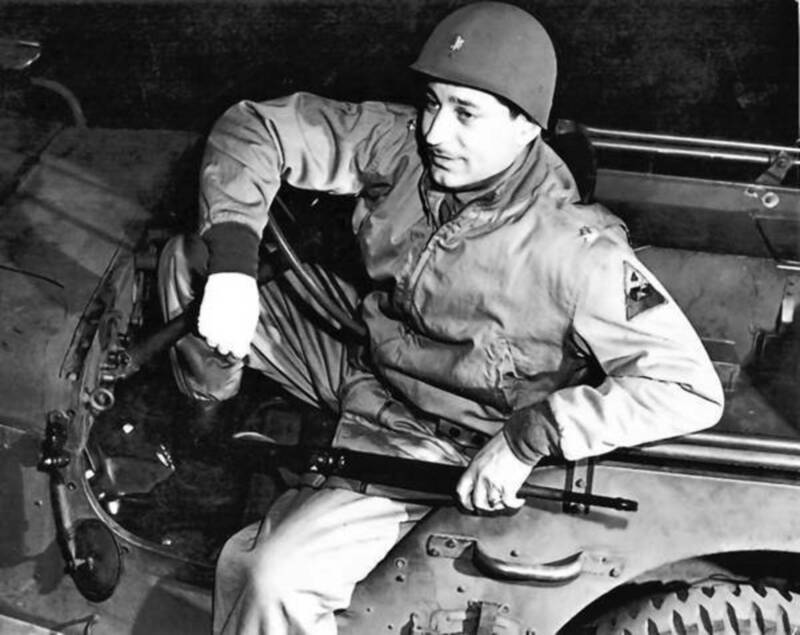 At the announcement that WWII General Patton had died in a motor vehicle accident in Europe, my dad was not surprised and said "His units had the poorest vehicle safety record of all the units in World War 2." 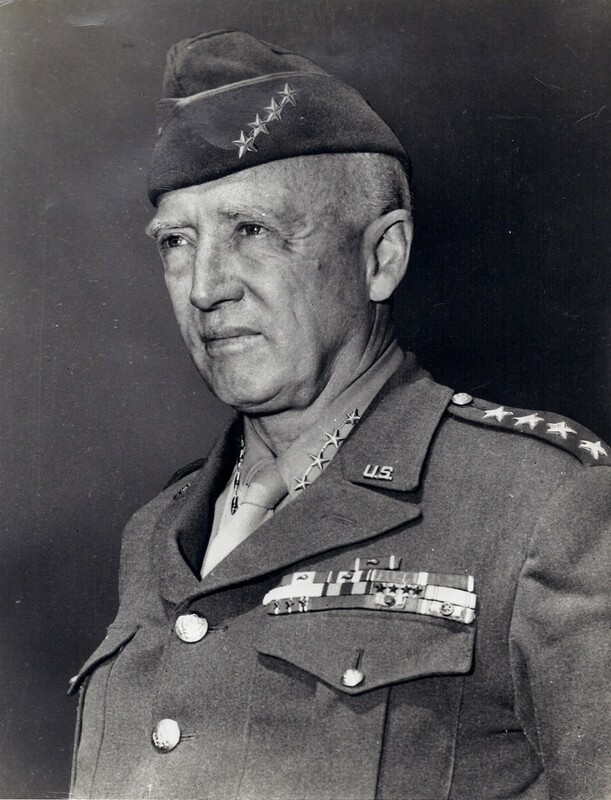 I had General Patton's son as my English instructor at West Point, and the son went on to become a well-liked and respected officer (Armor) in the U. S. Army, eventually retiring to a retirement his father never got to enjoy. Thanks very much, Hannah. Really appreciate it. More is on the way. I brilliant piece, very interesting, well researched and well written. I enjoyed reading and look forward to looking at more of your work. Thx, Mr. Bachner. I had never seen the Patton funeral photo either. I had only seen a small portion of newsreel showing the burial party. Lucky to have found it. Glad you enjoyed it and I do my best to keep the vets' stories alive. This is a great story Lions and I enjoyed it very much. There are so many personal stories by veterans it is a shame that many are and will go untold. 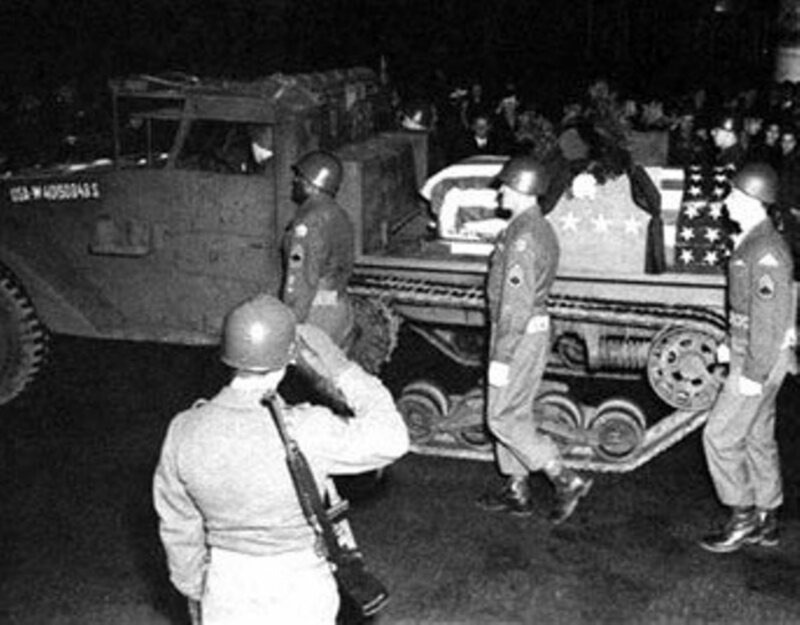 The photo of Patton's funeral is one I have never seen and I appreciate it. Harald, I'm honored that I could impart knowledge to you. I write to inform. I have the great honor to interview so many vets, and when I spoke to a witness who was at Hammelburg, it was an amazing experience. Thanks very much. I knew next to nothing about any of this. The incredible amount of research you did is obvious. Great job, CJ. An excellent read! (as all your other articles of course:) I had seen something about this event on Patton 360, but now I have the complete story! Another excellently executed historical account. Thanks! Thx Mr. Palumbo. It's high praise. It is always a pleasure to read your interesting articles, and I thank you for this one.